Motion, sensuality and narrative edge…the molten physicality of blues with Southern rock and gospel kneaded into the dough. NASHVILLE, TN: I might as well come right out and say that I wrote my own bio, which was no easy task, no matter how many of them I’ve written for others in the past. As a music critic, I’m used to writing about what somebody else’s album amounts to. Here’s what I make of my own. 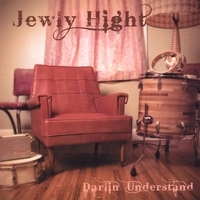 Darlin’ Understand is my first album—14 original songs (only one co-written) colored by the molten physicality of blues and the deep, unceasing pulse that I internalized through several years of playing the drums. I know this much—I’ve always been drawn to the more full-bodied and visceral approach to almost anything. I chose clogging—with its shuffling, loose-limbed motions and joyous whooping and hollering—over tap dancing, the drums over clarinet. The musicianship on Darlin’ Understand occupies a potent place somewhere between audaciousness and precision. Those responsible are Charlie Rich, Jr., Delaney Bramlett, Chad Watson—bass player for Charlie Rich, Ronnie Milsap, Janis Ian, Freddy Fender and Delaney Bramlett—Dave Perkins—who’s handled guitar for Ray Charles, Jerry Jeff Walker, Guy Clark, Lucinda Williams and Carol King—Dwight McConnell—bassist for Earl Thomas Conley and T. Graham Brown—Jason Eskridge—backing vocalist for Lyle Lovett and Jonny Lang—Bob Nickerson—who’s played drums for Sun Records, Jeannie C. Riley and Tammy Faye Bakker—and Joshua Whitaker—the raw, intuitive newcomer among the bunch. I co-produced the album with Watson and Nickerson, and let the latter use my 1975 Rogers drumkit throughout the recording process, the very same kit he’d used in the studio and on the road from ’75 to ’89 and later sold to me. That’s a story in and of itself. Darlin’ Understand breathes like a two-sided LP, book-ended by lap steel-washed, Flannery O’Connor-inspired incantations (“Part I Man Without a Gun” and “Part II Good Country People”) and punctuated midway through by an a capella chant set to heavy boot steps across my kitchen floor (“My Mother’s Daughter”). The passionate and the mundane are joined on the title track. The verses uncover the bones and sinews of a relationship—with a melody curling around a droning chord—and the chorus describes the humble, worn-in features of the partners’ world—eventually giving way to the cathartic back and forth of bottleneck guitar and B-3. “Guilt”—simultaneously pained and droll—was an occasion for me to play a blender with a beer bottle. Songs like “Some Things (Gonna Be Left Undone)” and “Junebug” cull earthy imagery from my family’s geographical center (rural Warren County, N.C.) and my more than hundred-year-old East Nashville home. “Pure Honey” melds minimal, hypnotic lyrics, modal vocal and bottleneck guitar melodies and the ragged dignity of a field drum march. As a seamless Southern R&B/rock and roll suite, “Poke Salad” and “Tiger” jarringly juxtapose internal and external sources of profound human pain. I’ve spent enough time with the album that I could go on forever. But I won’t. You have a listen.